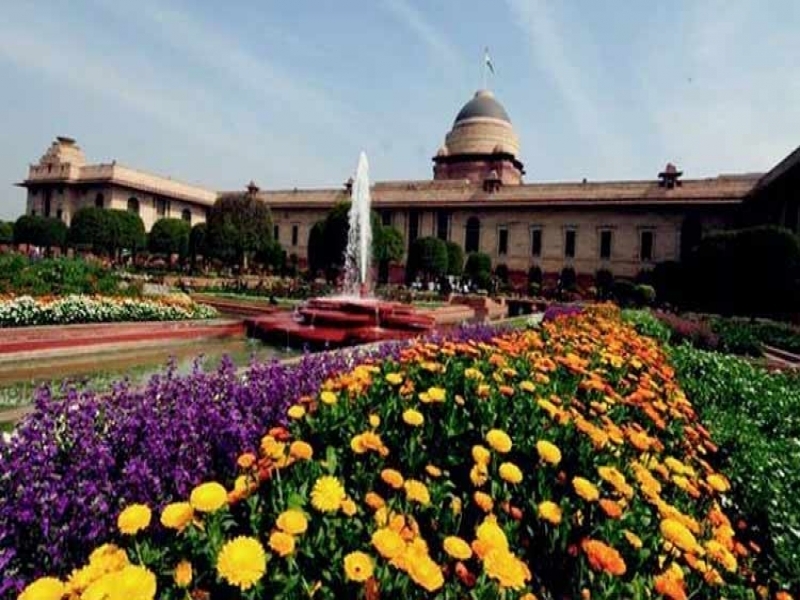 The Rashtrapati Bhavan's lush green Mughal Garden in Delhi is all set to welcome visitors from today. This year the Mughal Gardens are opening from February 6 to March 14 from 10 am to 4 pm. The lovers of nature will be in for a treat as 10,000 tulips, 137 varieties of roses and over 70 varieties of seasonal flowers will greet them at the sprawling 15-acre gardens. The special attraction of this year's "Udyanotsav" are bulbous flowerings and exotic imported flowers from the Netherlands and Japan. The President's Garden is a riot of white, yellow, red and orange. Floral carpets and beautiful patches of Pasadena, Pansy, China Man, Marigold, Antigun, Pink Parfait, Dahlia, Zambra, Latonia floral varieties will be a sight for sore eyes. The nearest metro station to reach the Mughal Gardens is Central Secretariat. From here you can get down at Rail Bhawan and walk till gate number 35 of the Mughal Gardens. The entry fee of Mughal Gardens is zero. Yes, you do not have to pay anything to reach there. You can visit any day from 10 am to 4 pm between February 06 and March 14 except for the Mondays. As the name suggests, the Mughal Gardens are divided into several sections with as many as six gardens and areas for other activities. The Central Lawn of the Rectangular Garden is the main venue for the annual 'At Home' ceremonies hosted by the President of India on Republic Day and Independence Day. The place has witnessed special guests, celebrities and eminent figures. The 12 feet high walls are covered with creepers like a flame vine, trumpet vine, Lassan bel and Jasmine that add fragrance to the garden. Along the walls, one can see the China Orange trees or Kumquats that have been planted. Long Garden leads to the Circular Garden. A Bubble fountain concealed in a circular pond forms the centre of this garden. The pond has Lotus flowers and is edged with calendula and marigold. It is interesting to note that, a distillation unit is also installed next to the Circular garden for distillation of essential oils of aromatic and herbal plants from the Rashtrapati Bhavan Gardens. Demonstrations are also given to farmers during the annual Udyanotsav festival. Established in 2002 by Dr APJ Abdul Kalam, Herbal Gardens has around 33 medicinal and aromatic plants depicting their use are planted in these gardens. The garden has as many as 40 different plants and trees can be found here, including Khair, Bamboo, Sandalwood, Heena, Sita Ashoka, Butter Tree, Temple Tree, Kadamb Tree, Paras Peepal, Fig, Date palms, Krishna Burgad, Jasmine, Reetha and Shami amongst others. The best tree is Rudraksha tree which was planted by Dr Devi Singh Shekhawat on October 25, 2007. A pond was added to the Spiritual Garden on February 13, 2015. This water body, specially created, has varieties of Lotus and Water Lilies. Set up in the President's Estate in an area that was earlier used as a nursery, the Musical Garden has three large water fountains that demonstrate digital electronics, electromagnetism, hydrodynamics and hydrostatics. The music is digitized and the audio system fed through a computerized programme controller.